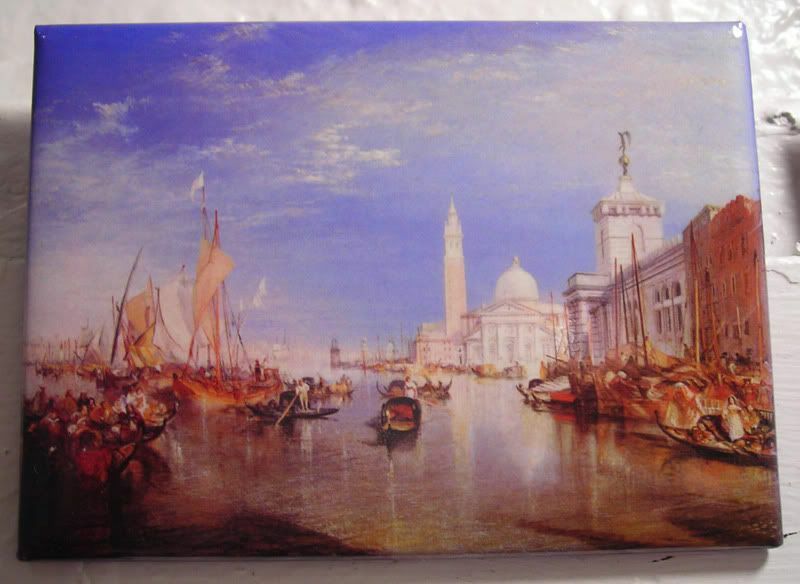 It's funny how many paintings of Venice I have in my little art gallery, so I picked this Turner, since I've not used him before. By this time in the musical ambassadors trip, we'd gotten a lot more comfortable with each other, having made friends and figuring out the routine of music rehearsals and performances, and then packing up our stuff quickly, boarding the bus and being shepherded and toured around towns that had all begun to blend together. Most of us silly high-schoolers slept through a lot of the guided bus tours, and suffered through the guided museum tours. To be honest, I can't imagine how anyone trusted us enough to go roaming the cities alone without chaperones - if our parents knew how much alone time we had, they'd have come along as chaps, too. Actually, though, that's what I remember most about my trip - running around each foreign country in a pack of 4 or 5...high-schoolers just mucking about major cities that didn't necessarily speak English. Which means that though we mixed with the locals, we didn't necessarily see all the touristy stuff to see. Venice was no different. We ducked the pigeons (YUCK) of most beautiful and famous Basilica di San Marco, saw Doges Palace and the Bridge of Sighs (even if I can't remember it), did our own little romantic walk through the canal bridges and back alleys of town, ate authentic pizza, did an organized boat tour (slept again), and therefore couldn't convince my friend to ride a gondola (hmph), and saw glass being made at the Murano glass factory (Chihuly has nothing on them). We were also set loose upon the streets of Verona...where we opted for a walk through town and authentic gelato, rather than visiting the infamous Romeo and Juliet balcony, or other famous churches and sites. Argh! We were in actually in Verona to see the non-Disney/Elton John version of Aida in the other world-renown outdoor arena. But we were on a 3-hour rain delay, during which we opted to find a place to serve the boys a contraband glass of wine, run around town in our best clothes, pretending to be a gangster and his mob moll. Nope, I kid not. It's amazing how a hefty Asian guy with a Swiss name can look like a big Italian bruiser while wearing a big-boy suit and sunglasses. Because I was and remain an anti-social weirdo, in Venice I ducked away from everyone else and visited the Accedemia by myself. ;-) It was great! I also saw a kitty. I had forgotten about the rain delay at the opera in Rome--do you remember the kids in our group started doing "the wave" during the delay and got everyone in the Coliseum involved? I love Chihuly! He follows me, though. I visited my grandmother in Seattle a few years ago and saw an exhibit of his with her, and a handful of months later found myself in London, walking into one of the biggest museums of the city to find... a Chihuly exhibit. What? I came all the way across the world and these Brits are featuring an artist I've already seen (in his home town)? Cut to this summer, when I had some time off in July. I wanted to go to my favorite museum in San Francisco, to see what they had that month... Chihuly. 'K. Scrub that idea. Watch me get to Venice one day and find all the glass makers have been shut down, and all that stands in their place are massive Chihuly installations. Oh, kate! I *totally* remember the Coliseum wave...we totally started it! It was awesome to watch it go around the arena. And, GG, I love Chihuly, I'm starting to feel, though, that every time I see him, it's almost the same work that I've seen elsewhere. Oh, and Murano's been around for centuries, so I'm hoping Chihuly's the "young" upstart. Heh.